I may have been cleansed by a Tsachila shaman in achoate hair that had a semblance with the Kenyan Masai, who swatted me with long thin leaves of a palm which had been sprayed with herbs and a special homemade alcohol as he spit fire, I may have tasted a blue seed off a blue and white bromeliad flower made up of a series of tiny balls and said to be a hallucinogen, walked through a breeding ground for butterflies after a rough descent into a town call Menden, and inhaled the aroma of chocolate from an orchid, but none of my experiences in Ecuador equaled the chocolate immersion. Cacao or cocoa or "cacahuati or cacahuabl" is considered the fruit of the gods. It was presented to the Aztec god Quetzalcoatl when he was a high priest and he decided to bring the seeds from heaven to plant on earth. Well, that’s what the legend is. And 3000 years ago the Olmecs made a heavy fermented drink, a sort of high-kicking bitter cocoa beer with no sweetner. Not a bad idea to revive today. 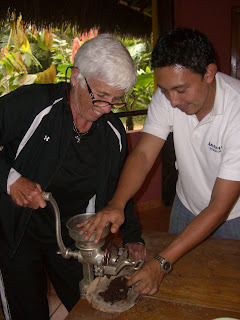 (The Hondurans turned chocolate into the hot drink we imbibe today.) Whatever cacao or chocolate puts money in the pockets of merchants of Central America but primarily Ecuador since more chocolate is produced in Ecuadoran mountains than anywhere in the world. It has been found in 7 BC excavations of a Mayan village and has addicted folks ever since. The Spanish invaders (remember Pizarro?) ran home fast with the new cocoa bean/hot chocolate discovery to present to the royal leaders. Sadly, it’s almost impossible to buy pure Ecuadoran chocolate from Los Rios, Esmeraldas or Manabi, the three zones where most chocolate is grown. All that's available is Nestles and M&Ms. Alas. Americanized. Today we are told this once-considered-sinful indulgence, although it puts on fat, is actually good for us if it is dark with a high percentage of pure ground cacao beans. 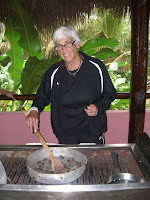 At Arasha, where cacao grows throughout the jungle-like grounds, they offer a class in making fondue from cacao beans. 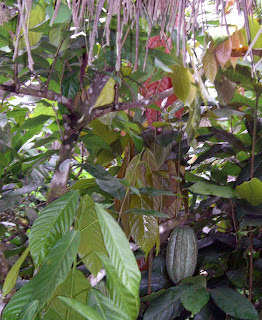 When the giant pods hanging on the plants sort of like papaya, turn red, they are harvested and the cacao seeds removed. The leaves are often dried and chewed as a stimulant. I remember that in Ghana in the early ‘60ties women with bundles on their heads chewing cacao leaves to keep themselves awake while riding long distances in crude Mammy Wagons. In the Lima airport, cacao candies can be purchased to help you deal with motion sickness and high altitude wooziness. They taste of and are made from cacao leaf. Once the seeds are dried, they are put in a hot skillet to roast. I was given the job of stirring them until finally the popping began. This meant they were ready. Then you push the seeds out of their shells and place the seeds in a hand meat grinder. Grinding is not easy by hand, but do it and a oily black pulp begins to emerge. I put my finger in it for a taste and it’s bitter but agreeable. Or maybe it was just being there in the moment in a jungle surrounded by cacao plants that made everything delightful. When all the seeds are ground, the paste is put into a wok like pan and stirred and stirred til it comes to a boil. Meanwhile a bit of sugar is added and dry milk. Not a lot so it’s not too sweet. But the stirring continues. Then some water is added to make a more liquid substance. Stir. Stir. Stir. Bubble. Bubble. Bubble. And presto - you have chocolate fondue which was poured over of course, an Ecuadoran banana. I wondered how much should eat. Delicious. Bu t there was more to come in the world of chocolate. A Relais et Chateaux hotel called Le Mirage also in the Northern Andes featured a spa which offered a complete chocolate emersion. They called it Death by Chocolate or the Total Chocolate Therapy. I had indulged in a Death by Chocolate cake once, but had no idea what was to come. The brochure offered that chocolate has healing properties and revitalizes and nourishes the skin and relaxes the body. Everything about this exotic place featured chocolate: balls of fruit covered in chocolate and Christmas colored sprinkles awaited me in my room every day. Sold, signed up for the complete chocolate moment. It began with a bath of peppermint mineral salts and floating rose petals (remember this is also the land of roses, where 25 roses cost only one dollar.). Then an Ecuadoran lady began to paint my entire body with hot thick chocolate. This was exfoliation in Ecuadoran chocolate supposed to do wonders to your skin, leave it soft as a baby’s bottom. So I was game at my age. After being painted in chocolate, I was then wrapped in plastic and a thermal blanket to cook while a chocolate mask was painted onto my face. For a moment I felt like a brownie with a scoop of chocolate decadent ice cream on the side. Sigh. I used to bake these kinds of indulgences. The face mask was much stiffer, colder and was later peeled off. The only bad part was I had developed a head cold in the Arasha rain forest and couldn’t smell how chocolatety I was. But I imagined it. Oh I imagined it. And when I saw myself painted brown, painted completely in chocolate, I had to laugh. I didn’t know if I should lick myself or not. No, I didn’t. I didn’t want to gain weight. You know how vain we women are. After all the chocolate was removed in a bath, my skin felt soft as a fuzzy towel. And I wondered as I strolled back to my room in a drizzle of rain if I carried with me the aroma of chocolate.